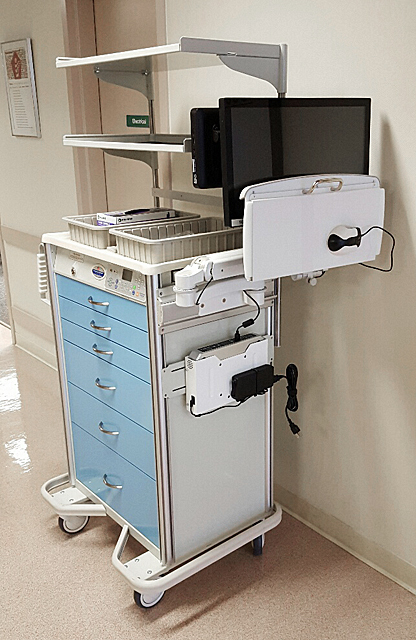 Case Study: Custom Supply Cart | ICWUSA.com Inc.
Caregivers can chart and deliver supplies from a single A-Smart Cart with the addition of an ICW mounting arm to hold the computer workstation. Solve expense and floor-space problems of needing two separate carts — one for supplies and a second for charting. Mobile supply carts are used throughout many hospitals. PACU, ICU, and ED areas usually have mobile supply carts stationed at bedside to hold equipment and required supplies. Computers are also needed at bedside for patient charting. A Workstation On Wheels (WOW) is often used to bring the computer into the room. WOWs that are rolled from room to room can spread contamination. WOWs take up precious floor space in the patient room and corridor areas. Purchasing additional WOWs significantly increases hospital overhead. Improves ergonomics. 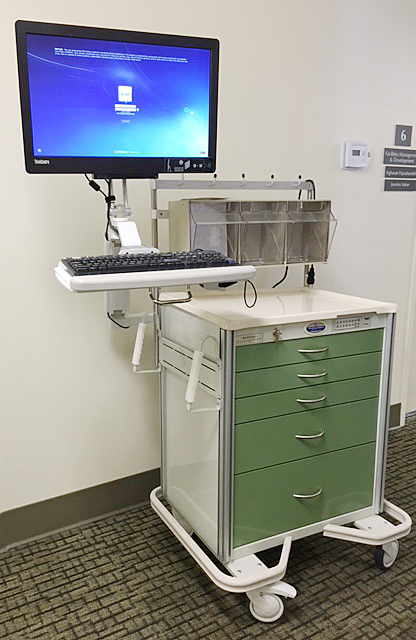 ICW computer mounts provide a comfortable, ergonomic sit-stand workstation while preserving the entire surface area of the cart for supplies. 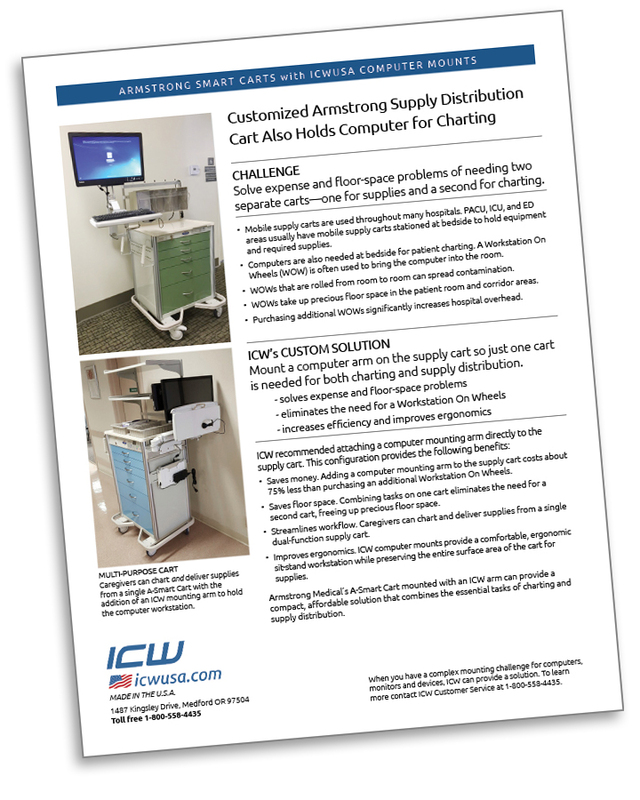 Armstrong Medical’s A-Smart Cart mounted with an ICW arm can provide a compact, affordable solution that combines the essential tasks of charting and supply distribution. A-Smart Carts are top-quality, heavy-duty supply carts. Their standard heavy-duty casters swivel and lock. A built-in stabilizer bumper gives Armstrong carts excellent stability. ICW designs, engineers and manufactures high-quality, professional mounting systems for computer equipment and other instruments for selected medical, custom and clean room markets. ICW mounting arms have outstanding range of motion. They swivel horizontally up to 360° at every joint and adjust vertically. All keyboard trays can be adjusted to positive, neutral, or negative tilt. Monitors provide 6-way tilt, pan and rotate. ICW arms fold up and stow the workstation close to the cart, making these mounts the perfect choice for tight spaces.